Is it just me or does the weekday coffee routine get a little boring sometimes? When I want to switch it up, I always go for steamed milk (yes this is amazing--when you use almond milk and the right blend of spices! ), hot lemon water or teas. One of my favorite teas is matcha. I'm a matcha lover. It's an amazing source of natural green tea energy, its earthy taste goes well with nearly anything and it's great hot or cold. 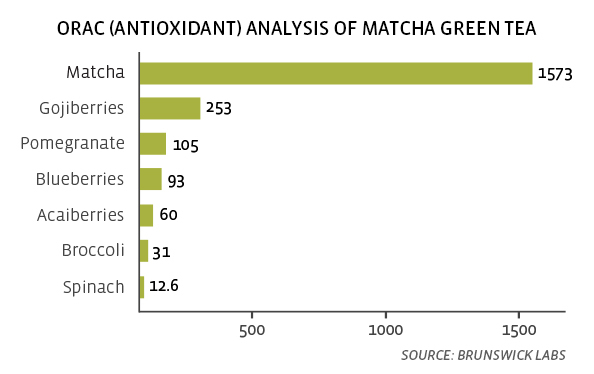 Matcha is also a good source for antioxidants (see chart below). Because matcha is such a good source of natural elements, I thought it would be fun to create a matcha drink that does even more for the body. Who wouldn't want a (tasty) drink that provides natural energy, antioxidants, amino acids...and maybe even a little protein, skin-feeding vitamins and anti-inflammatory properties? This recipe is easy to put together, most of the ingredients are regular pantry items and it takes just a few seconds to make in a shaker. 1. Add all ingredients to a shaker or blender and mix! 2. For an iced latte, pour over ice. To enjoy hot, pour into a mug and heat in the microwave for 1-2 mins. How do you mix it up? What are your go-tos when you want to take a break from coffee?